20 Minute Sesame Basil Chicken Noodles. 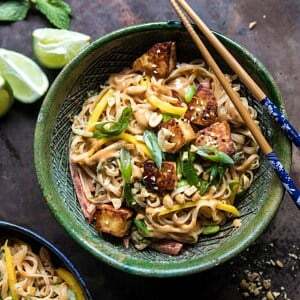 20 Minute Sesame Basil Chicken Noodles. Is there anything better than a 20 minute dinner?! I don’t think so. 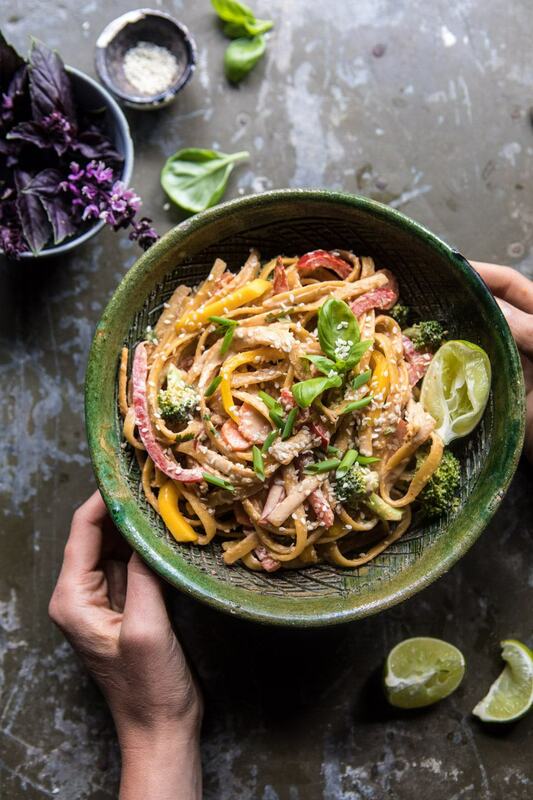 This quick meal is made using a spicy sesame sauce, noodles, lots of veggies, shredded chicken, and fresh basil. It’s both healthy AND delicious, and is the perfect dinner for just about any night of the week. Bonus? Leftovers are great for lunch, warm or cold! And just like that the weekend is already over. Not sure about you guys, but I’m feeling ready for the new week ahead. We have so much coming up and I can’t wait to dive into another full week. Anyone else as excited as me or am I the only freak who loves a good Monday? We spent the weekend picking fresh herbs, tending to cherry tomato plants, filming new videos, making skillet pasta, and baking peach shortcakes. It was the perfect mix of chill time, work, and even a little family time too. We’ve been having an unusually warm summer, and while my house is hotter than most would prefer, I personally LOVE it and hope the heat stays around until at least the end of August. Since I know the warm weather may be short-lived I am just trying to enjoy these warmer days…leaving the windows open and soaking up summer. No thoughts of fall until the end of August. Got it? Anyway, with my house being a little warmer than usual, I’ve really been looking for summer recipes that are (practically) no cook, require zero oven time, and are super fast to make. Not going to lie, it’s not the easiest task and I have definitely been turning on my oven more than I should. As I mentioned in Sunday’s post, I started work on a new project last week that has me cooking A LOT every single day. Some recipes are summery, but some are for fall and winter, so this means my oven has been running almost non-stop, and my house is consistently eighty plus degrees during the day. 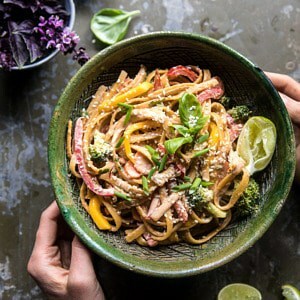 Thankfully, these 20 minute sesame and basil chicken noodles have become my go-to on days when I’m not cooking and don’t want to heat the oven up, but still want a healthy, homemade, summery dinner. 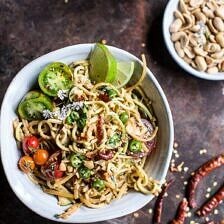 What I love most about this recipe is that it requires basically all pantry staples and vegetables that I almost always have in my fridge. It’s a dinner I can truly make any night of the week and at a moment’s notice. Start with the noodles. 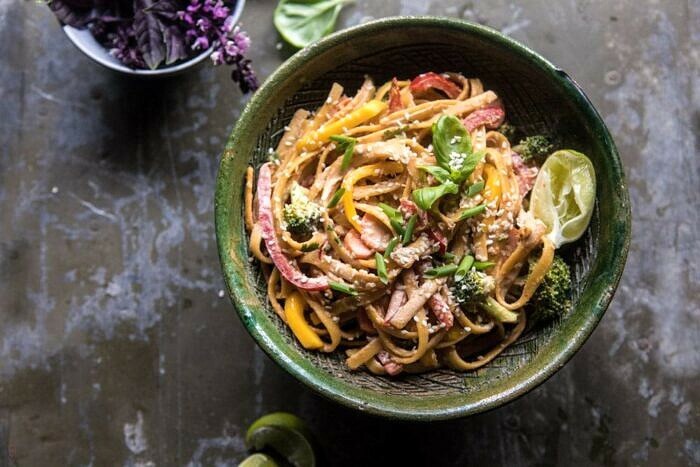 If you’re looking to go the mega healthy route, you can use brown rice noodles, but honestly? I love using fettuccine here. It’s not Asian in any way, but man, it is good. They hold up much better than a rice noodle ever could. Just sayin. While the noodles are cooking, make the sauce. It’s a tahini based sauce that’s flavored with lots of chili peppers, ginger, and garlic. 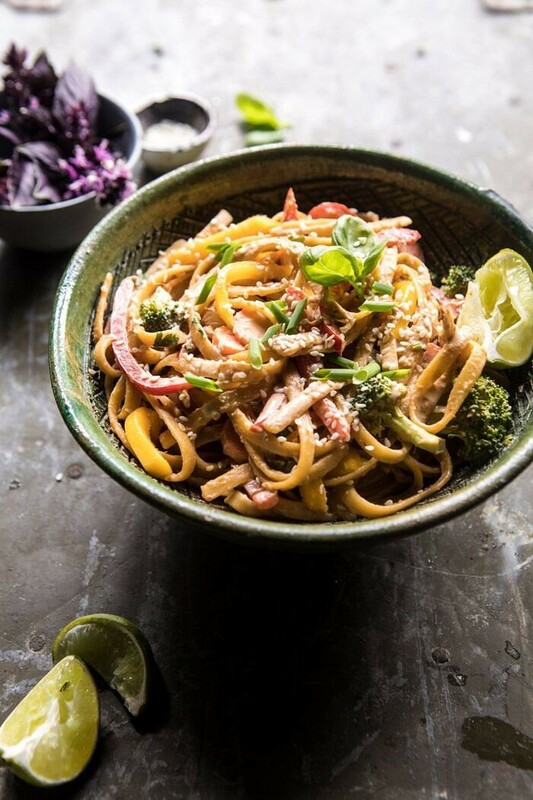 It’s all made in the blender and then tossed together with the hot noodles, shredded chicken, and vegetables. Add fresh basil and your dinner is complete. You can seriously make this in twenty minutes, less if your vegetables happen to be pre-cut…or you have a sous chef helping you out in the kitchen. Best part? These noodles are DELICIOUS. Salty, spicy, a little sweet, creamy, basily, and all kinds of perfect. I love using leftover chicken from grilling, but if you’re looking to do a meatless Monday style dinner, you can easily just omit the chicken or replace it with your favorite meat-free based protein, like canned chickpeas. Either way, the noodles will be great, as this recipe is really all about the sauce. As for the mix of vegetables, I used bell peppers, carrots, broccoli, and fresh mango (which, yes is a fruit, I do know this). Feel free to use you favorite mix of veggies or whatever’s left in your fridge. Make the recipe for best for YOU. And that’s kind of it. A super simple Monday recipe. Love it. 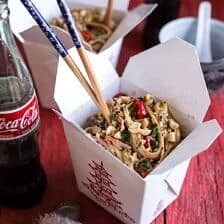 If you make these 20 minutes sesame basil chicken noodles, please be sure to leave a comment and/or give this recipe a rating! I love hearing from you guys and always do my best to respond to each and every one of you. Oh, and of course, if you do make this quick recipe, don’t forget to also tag me on Instagram so I can see! Looking through the photos of recipes you all have made is my favorite! 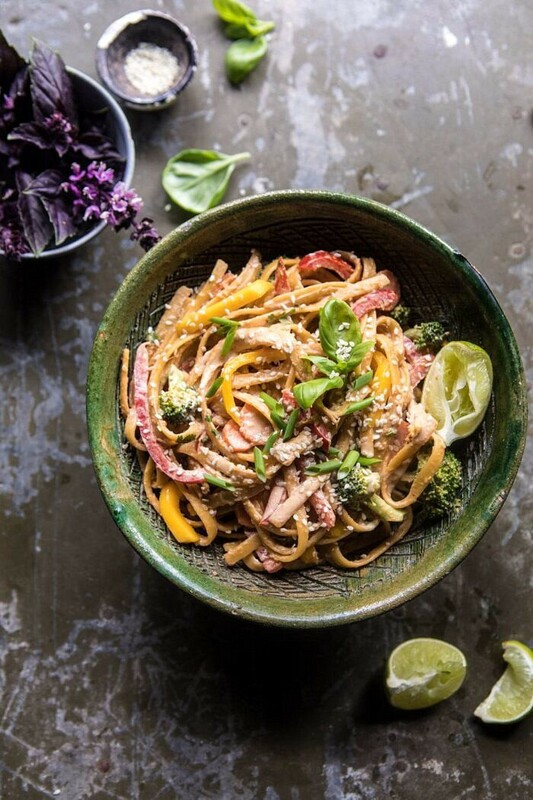 This quick meal is made using a spicy sesame sauce, noodles, lots of veggies, shredded chicken, and fresh basil. It's both healthy AND delicious, and is the perfect dinner for just about any night of the week. Bonus? Leftovers are great for lunch, warm or cold! 2. Meanwhile, combine the tahini, peanut butter, soy sauce, sesame oil, chili paste, ginger, garlic, and 1/2 cup water. Pulse until combined and smooth. Pour the sauce over the hot noodles. Add the chicken, carrots, peppers, broccoli, basil, and mangos. Toss to combine. 5. 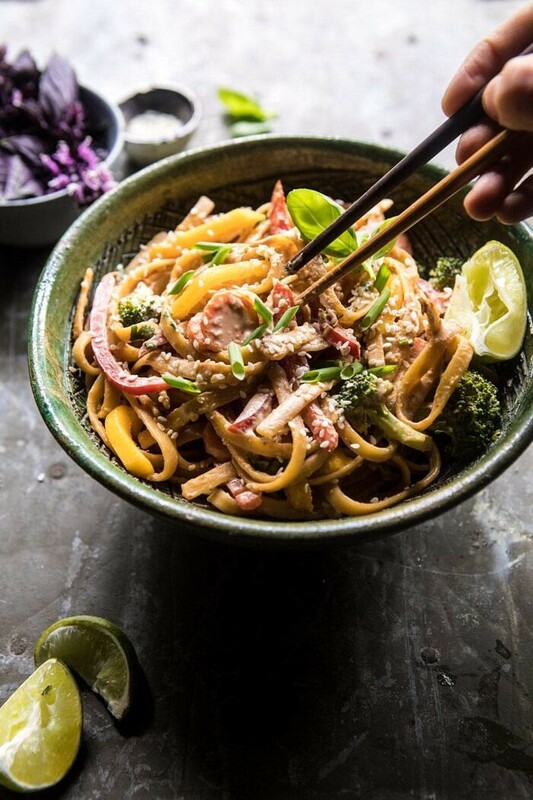 Divide the noodles among bowls and top with sesame seeds. What would you suggest substituting for the peanut butter? I cannot eat peanut butter. I cannot eat peanut butter. 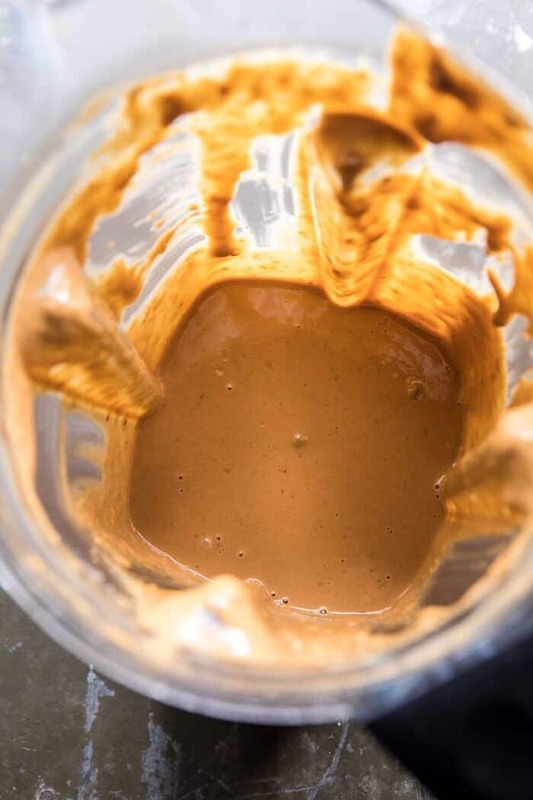 You can leave the peanut butter out and use tahini. Yum! 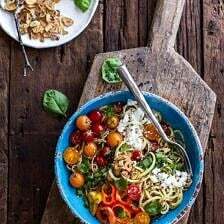 That looks so delicious and I love a fast dinner! hey girl- this looks amazing. yummy for my tummy! Delish! I love that I don’t have to think about what to make for dinner, I just go to your blog and everyone’s a winner! That is so sweet! Thank you so much Eileen! spicy and delicious! This is our 3rd HBH meal this week! We enjoy your flavors, I now take pictures of my beautiful food, and you do the hardest part for me every day; Think up what we should eat! We enjoyed this with yellow and red peppers, carrots, garlic scapes and sweet peaches that I had left over from our Ciabatta, sweet peaches, bacon, rosemary chicken and salad with parmesan dressing last night. Thank you Teigan for sharing your stories and your skill with us every day. YUM! I am so glad you have been enjoying my recipes and I hope you continue to Mary! Thank you so much! 20 minutes? yes please. Great easy weeknight dinner. I love that you used fettucini instead of rice noodles. I mean, I l do love rice noodles, but sometimes a nice thick hearty noodle is best. I hear you on the heat. We just moved to a much hotter area, and I feel like our place is hot all the time!! I hope you LOVE this Danielle! Nothing can beat a quick and delicious dinner! Made this tonight and it was a hit! I changed it up a bit by adding about 1/4 sliced onion and briefly sautéing the veggies. Thank you so much for all the great recipes. Thank you Lori! I am so glad you enjoyed this recipe! Another fabulous hit. I didn’t actually have shredded chicken on hand, but had some ground from another recipe that I’d had some leftover for. It turned out great. Another keeper recipe, as always, thanks for sharing! Thank you so much K! I am so glad you loved this recipe! I made this last night and it was INCREDIBLE. This is definitely becoming part of our weekly rotation. I made some swaps since I wanted to use up veggies from my farm share. We did zucchini noodles (raw) with sliced snap peas, green onions, kale and basil topped with the sauce and some salmon on the side. It was so so good- I highly recommend the zoodles with it too. Not only do they pair super well with the sauce, but they make this a meal that requires even less heat to cook— perfect for the crazy hot and humid weather we have in CT right now! Thanks, Tieghan! Hi Cassie! I am so happy to hear that you loved this recipe! Also, so fun to use zucchini from your own garden! Love that! Thank you so much! Trying this dish tonight! So you don’t cook the vegetables? Is it too spicy for young kids? Can you use just use a bit less chili paste? Hello. I don’t normally make things that can’t be thrown into the slow cooker and left alone (being a busy working mum) but occasionally I try something from HBH and have never been disappointed. This was no exception. I used pasta as recommended, and slightly grilled the veggies (I wasn’t sure if they were meant to be raw or not) in sesame oil instead of adding the oil to the sauce mix. Husband and 4year old loved it too, which is the true test. Thanks! Thank you! I am so glad you loved this Elsa! Also, so glad you were able to make this vegan to easily and it still turned out amazing! Would it be too bland without the chili paste? One of my littles is super sensitive to spicy, so I usually just make the spiciness available on the side for those of us that want it, but some recipes really count on the spicy for flavor. Thanks! This was great. A nice post church meal when we were all starving. My oldest son enjoyed it and he’s never pleased with anything I make. I made an excess of sauce so I will try to freeze for the next go. Appreciate the recipe.